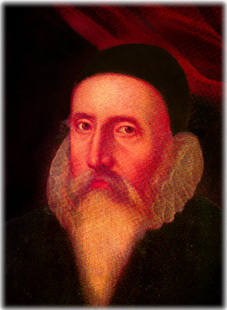 John Dee coined the word Brittannia and developed a plan for the British Navy. He was the first to apply Euclidean geometry to navigation; built the instruments to apply Euclid; trained the first great navigators; developed the maps; charted the Northeast and Northwest Passages. Having been involved in conjurations, with his close friend and associate, Edward Kelley, Dee summoned an angel who told him that Britain would have in their eventual empire. show stone which came from the Aztecs/Mayans and rests in the British Museum along with his conjuring table which contains the Enochian Alphabet he used as angel language. regularly and determined her coronation date astrologically. Thus making him an Official Philosopher to the Queen. the protestant response to the Jesuits. He was an alchemist; hermeticist, and cabalist, adept in esoteric and occcult lore. John Dee also was the official Translator of Euclid and wrote the famous Mathematical Preface, mapping mathematical studies for the future, a kind of system of the sciences based on math. It is said he deliberately put a hex on the Spanish Armada which is why there was bad weather and England won. Commissioned by Queen Elizabeth to establish the legal foundation for colonizing North America. a Welsh Prince who took a group over to New England in the middle ages and established the first colony, and intermarried with the Indians, but with little or no historical trace but for the legend. His accomplishments range from theatre arts to architecture. and King Lear in his famous writtings. "the Everest of cipher studies"--to the Holy Roman Emperor--Rudolph II--for a fortune in gold. John Dee posessed the greatest library in England with over 4,000 books in his collection. Including all works by Francis Yates, his greatest advocate: cf. especially THE ROSICRUCIAN ENLIGHTENMENT. John Dee played an integral part in preserving and employing the ancient tradition of magick.